News from LMCU: Everybody say... Scholarship! 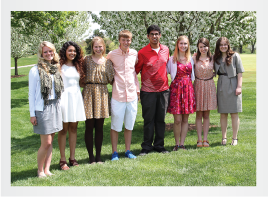 Eight very bright and talented West Michigan high school seniors stood up to be recognized as 2013 Lloyd F. Hutt Scholarship essay winners. As part of a luncheon held in their honor at the Cascade Country Club on May 8, each of the winners received a check for $2,000, to be used toward their future educational expenses. Congrats to all the winners, and thanks to all (419!) who entered!